A winter song, a song that knows and embraces the wind and rain, a song that knows where to find the warmth – in song, in love, in wine, and friends. 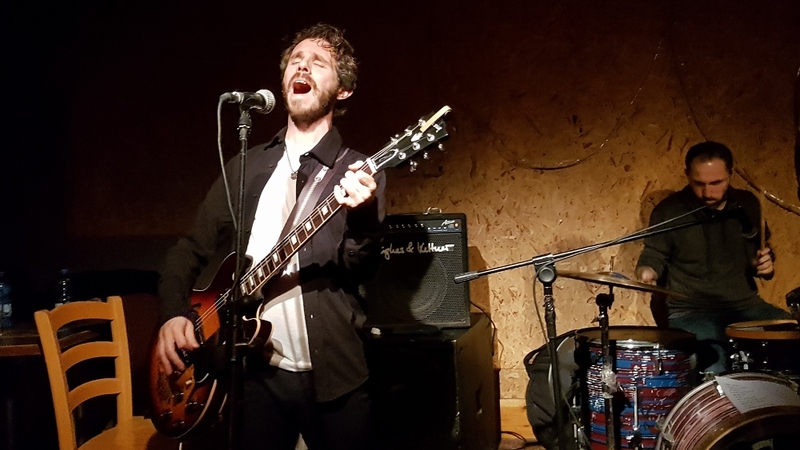 That was the vibe at the Hoodna Bar, with singer-songwriter Ofir Somberg in a full band performance featuring Itay Mazilo (electric guitar and vocals), Noam Dikerson (bass), and Tamir Borsuk (drums). A terrific ensemble of musicians, the rapport between them runs deep, with an ease and warmth that was felt throughout the bar. Intimate and intense, Ofir’s songs possess stirring imagery that touches mind and heart, moving from tender to thundering rock in a heartbeat. 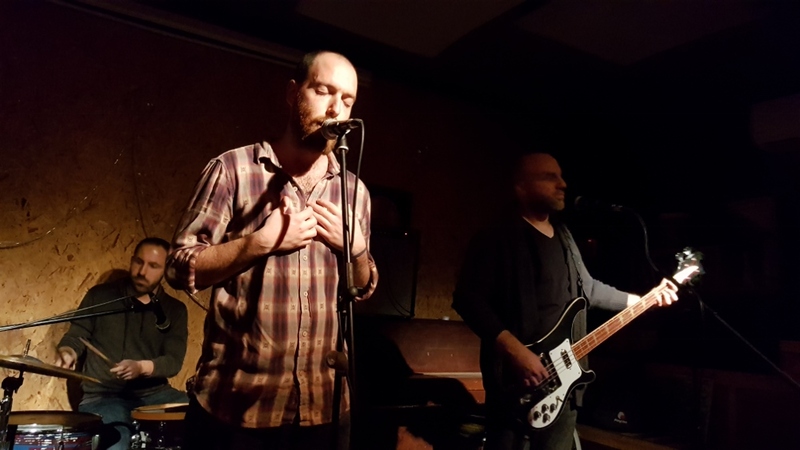 Drawing on a rich repertoire of songs in Hebrew from his 2013 album Kmo Ashan (Like Smoke*), the night’s set included the latest single Anshei Mizvadot (Suitcase People) as well as new songs. Ofir opened with Passim (stripes or bars, like on a window or prison cell), its lyrics reflecting intimate truths against a rock sound: “Inside cracks in the wall/ a ray of sun waits/feel it within/opening the bars of you.” Love, lost love, ambivalence, a seeking soul, and the feel of South Tel Aviv permeate these songs. Precise and never sentimental, Ofir’s imagery is vivid and striking, with an edge and a trace of a smile. In one of my favorite songs, BaHoref Haba (Next Winter), lovers are compared to children running into the street, unafraid. Warm and tender, at times almost delicate, in some songs Ofir’s voice floats over hard-driving guitars and drums; in other songs, it’s all power and passion. In a night of surging energy and beautiful moments, one song stands out with its sweet sense of mise en abîme: as the set came to a close, Ofir sang solo, casting his spell throughout the crowded room with BaHoref HaBa, a love song of winter, in winter, of drinking with friends in a bar, at the Hoodna Bar. Ofir Somberg’s facebook page; music available on bandcamp. *all translations were spontaneously generated by me, to give the general feel of things, and should not be mistaken for official translations.